Who would have thought Ash Vs. Evil Dead would actually be this good? When it was originally announced that director Sam Raimi, star Bruce Campbell, and producer Robert Tapert were returning to their legendary B-movie horror franchise, there was reason to believe the dark magic wouldn’t follow. 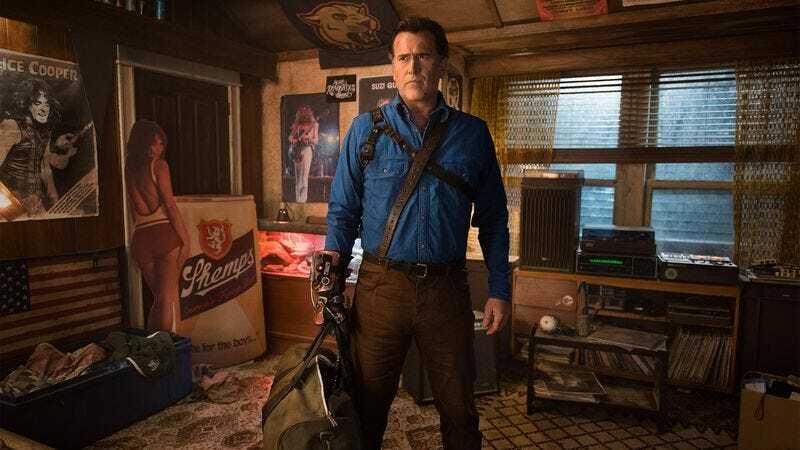 It had been more than two decades since 1992’s Army Of Darkness hit theaters, and the 1981 original had just seen an unforgiving remake a few years prior by Don’t Breathe director Fede Alvarez. But when the show finally arrived last Halloween, it was clear that it isn’t the years for this franchise, it’s the mileage, and there’s plenty of gas left in the tank. Unlike so many nostalgic remakes and reboots, the first season of Ash Vs. Evil Dead respected its past but also looked ahead to the future. Raimi, Campbell, and Tapert expanded the mythology and breathed new life into the title character by giving him a sense of purpose beyond hacking and slashing toward a predictable “Groovy.” It would have been so easy to simply toss buckets of blood on Campbell and write a different one-liner each week; instead, they carved out a lived-in world and conjured up a handful of characters that could go toe to toe with the charming, chainsaw-wielding jerk. Granted, not all of it worked—sadly, they never figured out what to do with Jill Marie Jones’s Amanda Fisher—but with a little ’70s rock ’n’ roll, showrunner Craig DiGregorio delivered 10 rollercoaster episodes. Now he’s back with another batch. At the end of the first season’s gory mad dash, Ash and his faithful sidekicks—Dana DeLorenzo’s sarcastic Kelly Maxwell and Ray Santiago’s doe-eyed Pablo Simon Bolivar—were heading to Jacksonville, Florida, in search of paradise. They had just made a deal with Lucy Lawless’ beguiling antihero Ruby Knowby, and the world was literally crumbling around them as they cruised down the dusty trail. As expected, the three are living it up in the Florida coastal city; or rather, Ash is having a ball while Kelly and Pablo pick up the slack in a sleazy bar straight out of Revenge Of The Nerds II. This lifestyle comes to a halt, however, when a hard-pressed, down-on-her-luck Ruby is forced to summon Ash back to Michigan—specifically, his hometown of Elk Grove. Whereas last season found Ash and his trusty Ghost Beaters stumbling from one place to another with blood, guts, and empty beer cans in tow, the second season of Ash Vs. Evil Dead is an ill-fated homecoming. It works out great, because it forces the character to face his inner demons spiritually and physically. In the season 2 premiere, he’s berated by his crusty father, Brock Williams (a lewd, rude, and crude Lee Majors); haunted by the untouched room of his late sister, Cheryl (original star Ellen Sandweiss reportedly returned to shoot new scenes); and nearly laughed out of a dive bar by angry townies and the sheriff himself (a promising Stephen Lovatt). In other words, there’s plenty of evil for DiGregorio to play with this season, and he’s already caused quite a ruckus two episodes in. Almost immediately, Ash, Pablo, and Kelly are tossed into a series of unfortunate events, and it’s made clear that all three still have some deadly baggage to sort out. Ash’s problems are more up-front, what with his heritage and reputation back home, but Kelly’s and Pablo’s respective conflicts feel more intangible, like the stuff that could actually do them in. Both characters had to wrestle with some impossible evils last season, from possession to familial secrets, and as Stephen King once wrote, “sometimes they come back.” Considering the season’s core throughline feels a tad murky this early on—they’re still playing the whole “is she or isn’t she?” with Ruby—these more personalized terrors keep the tension severe enough to cut through much of the rampant situational humor. And, boy, there’s a ton. That’s the joy of this series, though. It’s gross, it’s ridiculous, it’s even stupid, but it’s cleverly self-aware about all of this. From the editing down to the line delivery, Ash Vs. Evil Dead is always in on the joke, and that’s why it’s able to saw its way into the next story without looking too far ahead. Sure, DiGregorio continues to maintain the tones of the Evil Dead lexicon, capitalizing on the mysticism of the series, but the show has ultimately become something else. It’s chewy popcorn television, where everything zips by at face value, from the laughs to the thrills to the kills, and once again, Ash Vs. 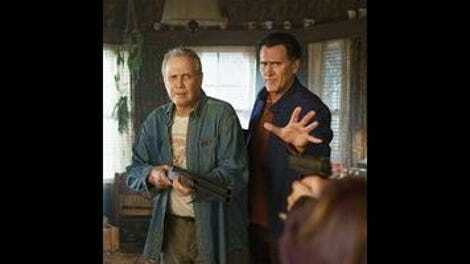 Evil Dead delivers this mayhem with gutsy results. After all, where else could you see the former Six Million Dollar Man with his pants down?